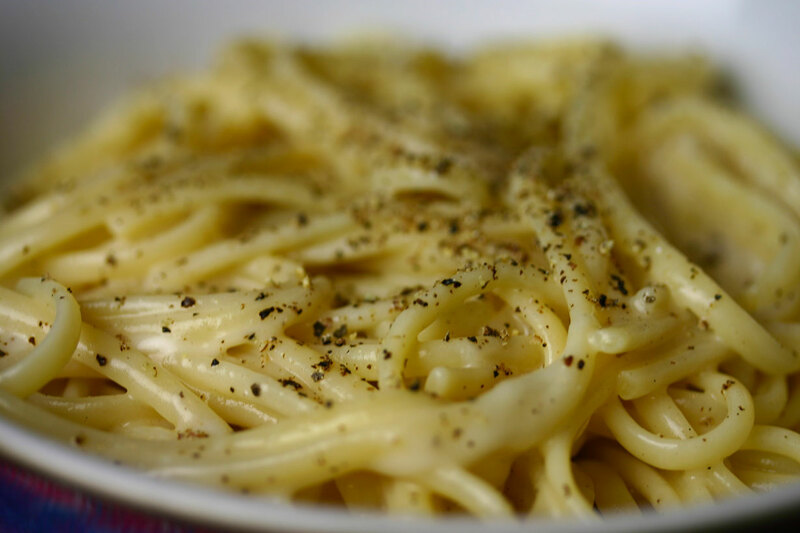 Pasta cacio e pepe is the most Roman of dishes for me. With only three ingredients – pasta, pecorino and pepper – it sounds deceptively simple. The trick lies in successfully transforming the grated cheese and pasta water into a creamy sauce. Bring a large pot of salted water to the boil, and add the pasta. Place a large serving bowl in the sink. When the pasta is ready, drain it over the bowl to catch the cooking water and to heat the bowl. Tip all but a ladleful of the water back into the pot. Sprinkle half the cheese over the water and whisk vigorously to combine. Add the pasta to the bowl and toss thoroughly. Gradually add the rest of the cheese, thinning with water as needed to produce a creamy sauce. Season with Maldon salt, grate in lots of black pepper and toss well. Definitely – I love it!